Our slanted stackable shelving is a perfect solution for open-shelf filing needs. 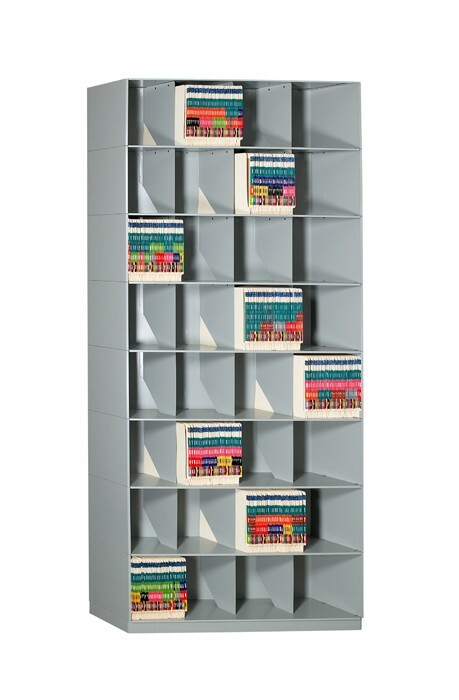 Designed to be used in conjunction with color- code end tab folders, our slant stackables come with fixed welded dividers and a sleek profile, making it an ideal choice for filing system storage. Our modular slanted units are designed with a 55 degree angled shelf resulting in increased file recognition and visibility for error free filing and faster retieval. Slant flies also protrude less into a room, saving valuable floor space. Slant files are available in both letter and legal depth. Need to expand your existing system? No problem. Our stackable shelving can be quickly reconfigured as your needs change. All of our stackable units are also designed for easy conversion to a movable lateral high-density mobile shelving system. Contact the experts at Franklin Mills to discuss slant shelving for your facility at 1-888-678-4585.